Snowfall Obliterates Records In Boston: 'Another Winter Storm?!' 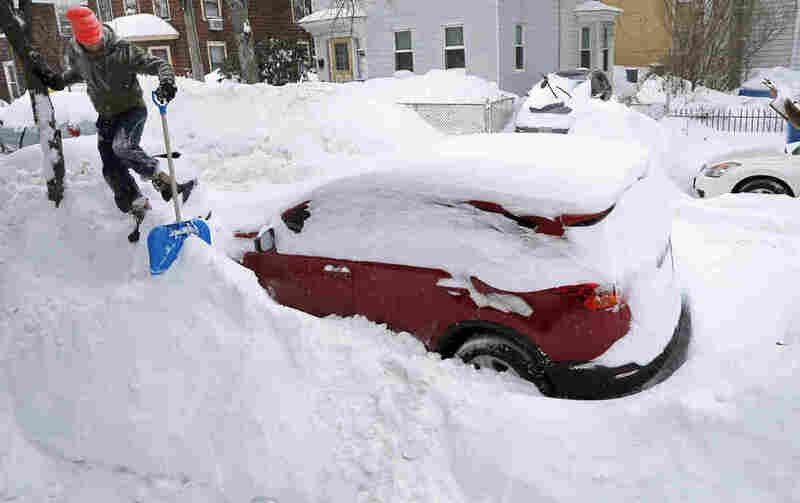 : The Two-Way Boston has had more than 72 inches of snow in the past 30 days, breaking a record set in 1978, the National Weather Service says. Greg Burkett clears snow from a winter storm in Cambridge, Mass., on Monday. Boston has had more than 6 feet of snow in the past 30 days. Boston has had more than 72 inches of snow in the past 30 days, breaking a record set in 1978, the National Weather Service says. The city has repeatedly been among the hardest-hit by several winter storms — and it could get another 4 to 6 inches later this week. This morning, the weather agency's Boston office tweeted, "Another winter storm?!" — along with a map forecasting 4 to 6 inches of snow for much of Massachusetts and neighboring states. Gov. Charlie Baker has signed an emergency declaration over the weather. On Tuesday, Boston's transit system "will be shut down the entire day," reports member station WBUR, "while many schools and government offices remain closed. Businesses are again being urged to let workers stay home." Since a slow-moving winter storm began dropping snow in Massachusetts on Saturday, more than 60 towns and cities have seen snow totals in the double digits. In 11 of them, more than 20 inches of snow fell. The town of Norwell, southeast of Boston, got 28.9 inches of snow; Rockland, in Plymouth County, got 29, the National Weather Service says. As for the system that's heading for New England later this week, residents of Maine and New Hampshire can relax — for a bit, at least — as the storm "is now expected to track out to sea," the AP reports. But forecasters also warn that another front moving in from the Great Lakes will probably bring more snow Sunday. Rhode Island Public Radio found two people who don't mind this snowy winter. Pawtucket resident Dennis Desjardin says the key is to plan. "You don't have to beat the rush to get to the store for the milk and bread if you plan and stock up ahead of time, and avoid having to make those last-minute runs when the weather's bad," Desjardin tells the station, adding that he thinks he's seen worse. "I love it," says David Lee of Smithfield. "I just came back from Salmon, Idaho, on vacation. We're getting food and some movies. Start the fireplace. And everybody gets a day off."